Traffic along an Istanbul street. (file). United Nations Secretary-General António Guterres today met with Turkey's President Recep Tayyip Erdoğan in Istanbul to discuss the situations in Syria, Iraq and Cyprus. Mr. Guterres is on his first major trip since taking the helm of the UN on 1 January, which will also take him to Saudi Arabia, the United Arab Emirates, Oman, Qatar and Egypt as well as Germany. According to a readout issued by the office of Mr. Guterres' spokesperson, the Secretary-General and the President discussed the Syrian conflict and the ongoing diplomatic efforts to end it. “The Secretary-General said he was grateful that the Astana conference was held in support of the Geneva process,” the readout said. The talks between the Syrian government and the opposition brokered by Russia and Turkey were held in Kazakhstan's capital, Astana, on 23-24 January. The United Nations-facilitated intra-Syrian talks are scheduled to resume in Geneva on 20 February. “The Secretary-General underscored the need to fight terrorism and extremists in Syria but that effort would not be successful without a political solution supported by the people of country,” the readout added. On Iraq, the Secretary-General expressed the need that the on-going operations to liberate Mosul and other areas from the Islamic State of Iraq and the Levant (ISIL/Da'esh) not exacerbate sectarianism but instead be a symbol of national reconciliation. 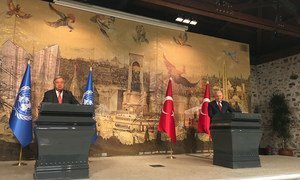 The Secretary-General commended Turkey for its outstanding generosity in hosting millions of refugees from Syria and Iraq. The two leaders also discussed the latest developments in the peace process in Cyprus, the readout said.